As kids, we all liked to pretend. It was our way of channeling the bottomless energy and curiosity that came with being young. It also gave us a higher purpose by making us the central figure in the world we created. And yet, at the end of the day, we always returned home to our parents. No matter how much they drove us crazy, we missed them, even though they didn't always understand us. Because adults were once kids themselves, you'd think they'd be more sensitive to kids expressing anger, fear and uncertainty. But I guess that's one of the prices of growing older — you forget what it was like to be young. 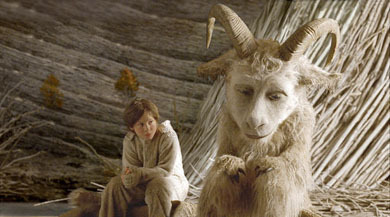 This was one of the many themes running through Maurice Sendak's beloved book, Where The Wild Things Are, which has been adapted into a movie by Spike Jonze, the gifted director behind Being John Malkovich and Adaptation (and with those two movies in mind, he seems like the perfect choice). The book is about an unruly little boy who defies his mother and gets sent to bed without supper. In his room, he walks into his closet, imagines himself a boat, and then sails across the sea to the Land of the Wild Things, which is populated by monsters, birds, and goats, and full of bountiful forests, deserts and no other humans, especially adults. This is the type of place they wouldn't understand.